The moment I found out I was pregnant with my first child, the bonding began! Did you know that your unborn baby can hear you talk to them? In fact, your fetus can hear clearly at 17 weeks or pregnancy. When I was pregnant with both of my children, I would sit in my rocking chair each night and read stories to them. My husband would sing AC/DC songs to them too, to make sure our children would be well-rounded! Both Ritmo Prenatal Audio Sound Systems provide a simple yet sophisticated way to effectively deliver sounds, music and recorded voices safely from your MP3 or smartphone directly to your developing baby in the womb. Ritmo is a comfortable, safe and FUN way to play music to your baby in the womb! It connects seamlessly to your own iPod/MP3 player, so your baby will hear the sounds and music that is important to you. Plus, you can wear it anywhere and everywhere! Disclaimer: I received a complimentary prenatal audio sound system from Ritmo for the purpose of writing a review and hosting a giveaway. Regardless, I only recommend products or services I use personally and/or believe will be a good fit for my readers. The views and opinions expressed on this blog are purely my own. Results may vary. No monetary compensation was received. Ritmo and Ritmo Advanced both provide a simple yet sophisticated way to effectively deliver sounds, music and recorded voices safely from your MP3 or smartphone directly to your developing baby in the womb. That it helps calm your baby in utero! provides a simple yet sophisticated way to effectively deliver sounds, music and recorded voices safely from your MP3 or smartphone directly to your developing baby in the womb. loved that It connects seamlessly to your own iPod/MP3 player, so your baby will hear the sounds and music that is important to you. I learned that Ritmo and Ritmo Advanced both provide a simple yet sophisticated way to effectively deliver sounds, music and recorded voices safely from your MP3 or smartphone directly to your developing baby in the womb. I learned it has surround sound. 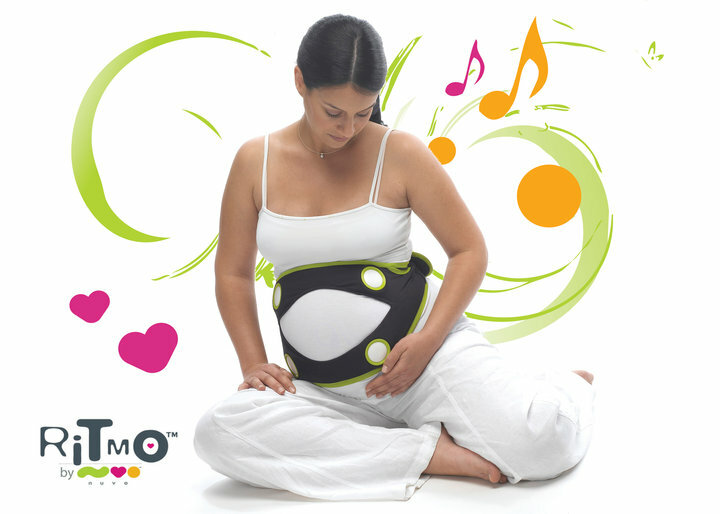 Ritmo Allows each mother to decide the exact sound listening volume she believes is the safest for her developing baby. Ritmo complies with the stringent safety standards of the CE & FCC. I learned that it allows you to adjust the volume to what you believe is safest for your baby. I learned it's the best way to play music safely and effectively to your womb.This is so much better than putting little tiny headphones on my belly.That was what I did 26 yrs ago when I was pregnant with my daughter.Thanks for the awesome giveaway! I have been using the Ritmo for about two months and love it. It is easy to use and awesome for working out. Just put it on and insert your ipod and go! You can control the sound with different volumes for you and the baby. It doesn't move around while working out and is so comfortable. We also use it with our two younger children to record stories and let the entire family be a part of the birth process. I absolutely love my Nuvo Ritmo Pregnancy Sound System! It is so easy to set up and use. I play music to my little Girl in the morning and night to stimulate her brain development and I could not be happier with it! I just love that it has an extender to extend when you are growing and I hook up my IPod touch right up to it and play music. I defiantly would recommend this to every pregnant women and especially those who would love to get alittle music into their babies lives!